Seven months before his shock election victory, Donald Trump promised a crowd in Rhode Island he would not use Twitter if he became president. Why? “Not presidential,” he said in April 2016. Fast forward to the one-year anniversary of his inauguration. Not only has he continued using Twitter since moving into the White House, he’s done so with vigour, sending 2,608 tweets in the past year – some mundane, some inflammatory. It’s “modern-day presidential”, Trump said (in a tweet, naturally). To get a fuller picture of this thoroughly modern-day president. we’ve gone through every one of those 2,608 tweets. Among our findings are that 32% of his tweets were sent between 06:00 and 09:00 (perhaps it’s not a coincidence that this is the time his favourite TV show, Fox and Friends, is on air). So who has felt his wrath the most? And who has he praised most often? In all, Trump has been critical 135% more than he has been complimentary – 1,238 times compared with 527 (at times he has criticised up to seven different targets in one tweet). His most regular target is, of course, the media. It took him four days into his presidency to first attack the media – praising Fox News’s ratings for his inauguration, and mocking CNN at the same time. The latter network became the subject of his most shared (and second-most liked) tweet of his presidency to date. Close to 361,000 people retweeted a mocked-up video that he tweeted in July, of him wrestling a CNN logo to the ground. The clip provoked outrage. 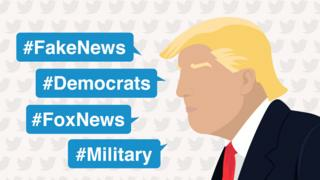 His fury with the media reached its peak on 28 May, when he sent six tweets in 12 minutes early in the morning attacking “fake news”‘. The tweets were posted hours after media outlets reported that his son-in-law and adviser Jared Kushner tried to set up a secret backchannel with Russian officials. His biggest lull in attacking the press came in August, when two hurricanes and an escalating crisis with North Korea saw him not tweet about “fake news” for two weeks. It may come as a surprise to learn that Trump tweeted only once about North Korean leader Kim Jong-un in his first seven months as president – and that it was a tweet praising him for apparently delaying a decision on whether to hit Guam with a nuclear weapon. However, he was back a month later calling Kim “a madman”, then “short and fat” a month after that. 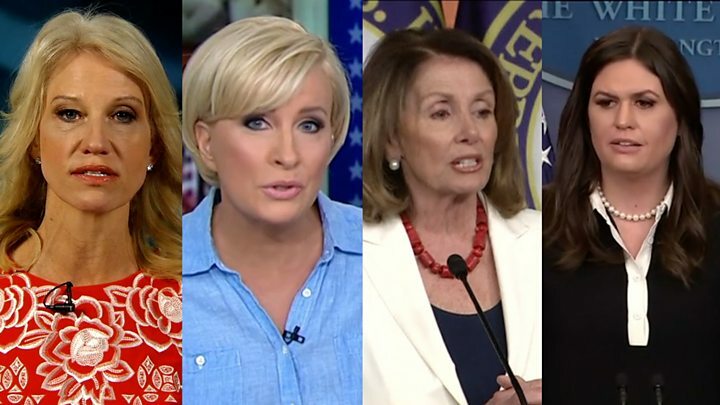 Brzezinski and her co-host and partner Joe Scarborough then said they were warned a tabloid would run a negative story on them unless they said sorry for their coverage of Trump. They called his tweets “vicious” and “frightening”. Yes, the former governor of California, one-time Terminator and ex-bodybuilder had a Twitter quarrel with the president this year. Arnie, who succeeded Trump as the host of The Celebrity Apprentice, was a regular critic of the president, attacking him over his withdrawal from the Paris climate deal, and for his response to white nationalist violence in Charlottesville, Virginia. The president tweeted about him after he left the show. On 3 June last year, eight people were killed in an attack on two areas of the British capital. Cue Trump. (Note, this tweet was written before the death toll rose). PM Theresa May, who had previously stopped short of criticising the US president’s comments, said his reaction was “wrong”. Khan criticised Trump’s “ill-informed tweet” that “deliberately” took his remarks “out of context”. His reaction drew renewed calls for an offer by the UK government for a Trump visit to be withdrawn. It wasn’t, but that visit still hasn’t taken place and there isn’t yet one scheduled. In March, the rapper released a video showing him spoofing a presidential assassination (the victim bore more than a passing resemblance to Trump). Late in 2017, Snoop Dogg released a new album. Its cover featured a body in a mortuary with the name tag ‘Trump’ attached. It may come as a surprise to learn that President Trump has actually praised more people on Twitter than he has criticised. He’s praised 214 individual people, groups or places, while he has attacked 140 targets. But many of his tweets of praise are one-off, formulaic messages congratulating officials over visits to the White House, or over meetings that Trump attended. He has fewer targets for his critical tweets – but attacks them far more often. His first tweet of praise after his inauguration was to Fox News for their “GREAT” review of his speech – and the conservative network has been one of the most regular recipients of his warm words. His own cabinet and family are rarely subjects of praise – Kushner, for example, is praised as often as the Pittsburgh Penguins ice hockey team (once). It is notable, however, that Trump has started to praise Republican leaders more and more over recent months – hinting at a willingness to work more alongside his party. …came a few hours after an interview Don Jr gave to Fox News’s Sean Hannity. In it, Don Jr sought to dismiss the relevance of emails sent before he met a Russian lawyer who promised damaging information on Hillary Clinton in 2016. A special counsel is investigating whether the Trump campaign colluded with Russian officials. The White House later released a statement from Trump praising his son as “a high-quality person”. You may not have heard of them, but Diamond and Silk are two sisters and YouTube personalities from North Carolina. They are both big fans of Trump, and have praised his “non-traditional approach, untainted by Washington’s one-sided politics which give power to special interest groups”. Their posts were retweeted twice by the president during the year, and in November he called them “great people”. Player is not the only golfer to be praised by the president in the past year (take a bow, John Daly, Park Sung-hyun, ) but he is the only one to get a birthday greeting. Incidentally, the others Trump gave birthday wishes to on Twitter were: his wife Melania, various military outlets, the CIA, evangelist Billy Graham and country singer Lee Greenwood (at the second time of asking). And he really does seem to have enjoyed working with him, praising him on eight different occasions (only one world leader has been praised by the US president more on Twitter this year – China’s Xi Jinping, mentioned in warm terms 12 times). 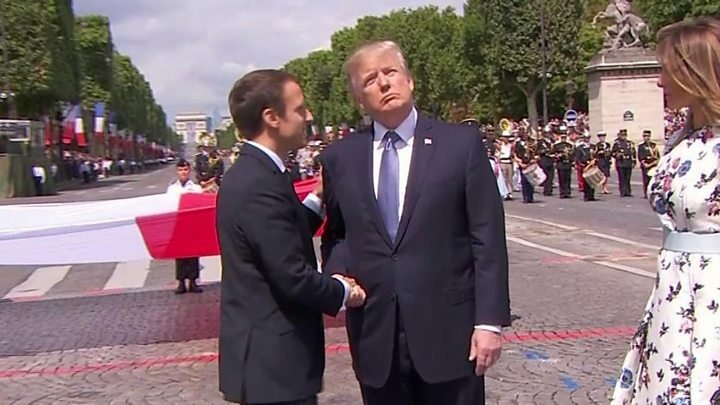 Trump and Macron’s friendship was sealed in Paris in July with a handshake that looked as though it would never end. Over the course of the year, a few people have been the target of Trump’s praise and his rage. At a rate of a little more than seven tweets a day from the Commander in Chief, prepare for a second year with plenty of rage (and a bit of praise mixed in too).